Alpha Kamban Estate is one of the residential developments of Alpha Foundations. It offers spacious and skilfully designed 1BHK, 2BHK and 3BHK apartments. The project is well equipped with all the basic amenities to facilitate the needs of the residents. Where is Alpha Kamban Estate located? The project is located in Reddiarpalayam, Pondicherry. What apartment sizes are available in Alpha Kamban Estate? The project offers apartments sized between 600.0 sqft and 1150.0 sqft. What is size of 1 bhk in Alpha Kamban Estate? The area of 1 BHK apartments ranges from 600.0 sqft to 625.0 sqft. What is the 2 bedroom size in Alpha Kamban Estate? 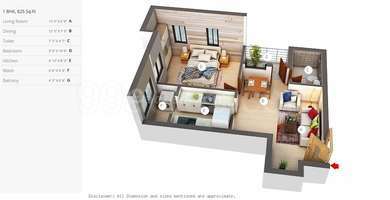 2 BHK units in the project are available in a size of 875.0 sqft to 950.0 sqft. What is size of 3 bhk in Alpha Kamban Estate? The area of 3 BHK apartments ranges from 1065.0 sqft to 1150.0 sqft. How much is the total size of Alpha Kamban Estate?The project is spread over an area of 1.6 Acres.